Seeking to shape the next EU science and innovation programme Horizon Europe, ALLEA presented a paper at last week’s Austrian EU Council Presidency conference in Vienna. The document underlines the need for understanding innovation as a factor to transform society, presents new approaches to integrate the Social Sciences and Humanities (SSH) and calls for a conceptualisation of impact that takes wider social, cultural and political developments into account. 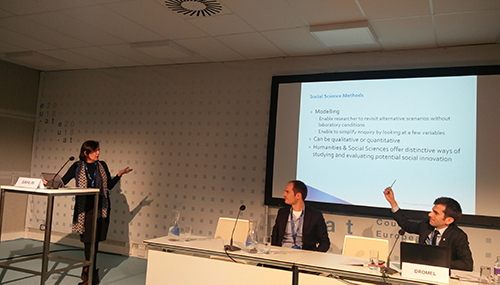 On 29 November, Professor Kerstin Sahlin, member of the ALLEA Working Group Horizon Europe, the Royal Swedish Academy of Sciences and the Royal Swedish Academy of Letters, History and Antiquities, presented an ALLEA paper at the “Austrian EU Council Presidency Conference on Impact of Social Sciences and Humanities for a European Research Agenda”. Prof Kerstin Sahlin presents the ALLEA paper at the EU Council Presidency conference in Vienna on 29 November. The paper, entitled “The Importance of SSH Research in Horizon Europe” and composed by Working Group Chair John Bell (British Academy), is based on the discussions that have been taking place over the past months within the Working Group. The full paper will be published as part of the conference proceedings in the Journal for Research and Technology Policy Evaluation (Fteval). The paper warns of the dangers of emphasising the economic impact of research alone. According to the document, such an approach could foster “a technocratic paradigm in which the translation of fundamental research into innovative ‘products’ is seen as the benchmark of success”. “In the past, the Commission has understood the relationship between research and innovation too much in terms of an overly simplistic, linear process in which research is expected to lead to ever higher Technology Readiness Levels (TRLs). The dominance of this paradigm belittles the contribution of Humanities and the Social Sciences”, the paper reads. Humanities and Social Sciences can offer new approaches towards social problems that follow non-experimental methods and use imagination and modelling to think through “what if?” scenarios, as well as challenge norms and traditions to foster social innovation. Social Sciences and Humanities also help to consider non-material features of the human existence. “The quality of life depends not on having new gadgets or new products, but on being able to live a life which has value that may make use of what technology has to offer in a valuable way. Vision, beauty, style, and enjoyment are integral to a valuable human life”, the working group argues. All this can only be achieved in a joint endeavour, especially by intensified inter- and transdisciplinary cooperation across Europe and beyond. The challenges ahead call for a profound and inclusive dialogue between all actors in society.